When ticks were sealed in nylon tetrapacks and infected with the entomogenous fungi, Beauveria bassiana and Metarizium anisopliae and maintained in potted grass in the field, the fungal oil formulations (109 conidia per ml) induced 100% mortality in larvae of Rhipicephalus appendiculatus and Amblyomma variegatum, whereas mortalities in nymphs varied between 80–100% and in adults 80–90%. 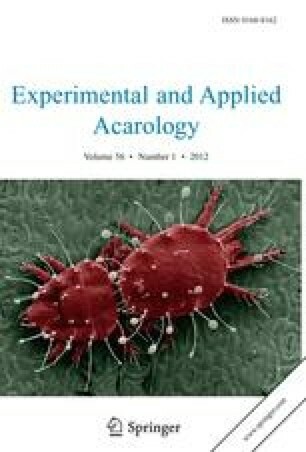 The aqueous formulations (109 conidia per ml) induced mortalities of 40–50% and reductions in egg hatchability of 68% (B. bassiana) and 48% (M. anisopliae) when sprayed on Boophilus decoloratus engorging on cattle. The strains of B. bassiana and M. anisopliae isolated from naturally infected ticks were also found to induce high mortalities in both R. appendiculatus and A.variegatum in tetrapacks placed in potted grass. Both aqueous and oil-based formulations were found to be effective, although the latter induced higher mortalities. These fungal strains in aqueous formulation (108 conidia per ml) suppressed on-host populations of adult R. appendiculatus by 80% (B. bassiana) and 92% (M. anisopliae) when sprayed on tick-infested grass once per month for a period of 6 months. The feasibility of using entomogenous fungi for tick control in the field is discussed.